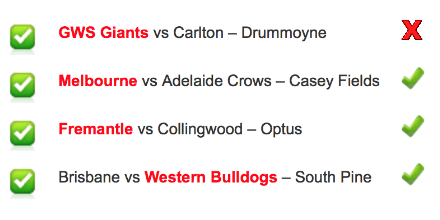 I’m a little disappointed in the 2018 AFLW Round 2 Results. I was hoping for an improvement, a perfect score no less, but as I said in last weeks post, I wasn’t overly confident, which is why I only put two bucks on a multi-bet. I was hoping to get at least the first two or three right, so I could cash out and make a little money. William Hill was my online sports betting site of choice last week because they had the best odds. Unfortunately, I got the first one wrong. I expected the Crows to lose, and I was right on that count. Oh, well, I can’t complain as two bucks in the scheme of things is a pretty small wager to lost. It’s like I always say if you’re going to do the sports betting thing you have to gamble responsibly! In case you missed the 2018 AFLW Round 2 Results lets have a look at those scores, shall we? Again the women’s games scores were a lot lower than the men’s games, but then you have to expect that. It’s only their second season, and they just don’t get the game time, including practice etc., that the men do. I was surprised when the AFL asked the AFLW coaches not to play so defensively because they wanted to encourage more scoring. While high scoring games are exciting, I believe the gameplay to be a critical factor. Look at soccer, for example, scores are also low but it commands a huge following! What do you think? On a lighter note and a completely different subject, I’ve just produced another video which I’ve published on YouTube. It’s all about Aussie Slang. In case you don’t know YouTube now requires that I have 1,000 subscribers to monetise my videos. I’m a couple of hundred short so I could use your help. I’m more than happy to return the favour and subscribe to your channel.